Even when it is melted and refrozen, chocolate still tastes good! Anyone who thinks that they are up for the Most Evil Mom of the Year Award, they can just go home now. I melted one of my children’s Halloween candy, the candy they trick-or-treated for in one of the coldest, wettest, and snowiest Halloweens in recent Rochester memory. Yes, an adjustment one must make when you are Transplantednorth is to allow for the possibility that it may snow for Halloween. My brave son made not one, not two, but three trick-or-treating runs this Halloween to collect the mother lode of chocolate, lollipops and other chewy, sticky treats. The numb toes and frozen fingers were completely worth it. And then, I had to go melt it all. It is partially his fault. If I didn’t hear him sneak candy at 6:15 a.m., if I didn’t hear the thudthud of the cabinets in the kitchen, if he would have had the discipline of self-control and not found every hiding place I ever imagined over the last 10 years of post-Halloween parenting, the candy would have gone unliquified. And how do I know my kids sneak candy from their Halloween stash early in the morning? The incriminating Kit-Kat wrappers left between the sofa cushions and NOT buried deep in the garbage can give them away every time. If you are going to sneak candy, do it right. Perhaps it is in my upbringing that I feel compelled to hide the Halloween candy. After all, I am the daughter of a dental hygeienist. Before the day when all Halloween treats must be pre-wrapped and store-bought, my family made bag after bag of buttered popcorn to give for Halloween, because mom thought this would be a more nutritious, less sugary treat for All Hallow’s Eve. My brother and I eagerly headed out the door for the real stuff. And after trick-or-treating, my brother and I, like any kids, dumped all the candy all over the first available indoor floor surface to assess the booty. After we gleefully eyed our treasure, mom would swoop in, eliminating anything that might stick to our teeth and cause tooth decay. Sugar Daddies? We could keep a few. Taffy and caramels? Out of the question, they were removed from our collection and immediately discarded. 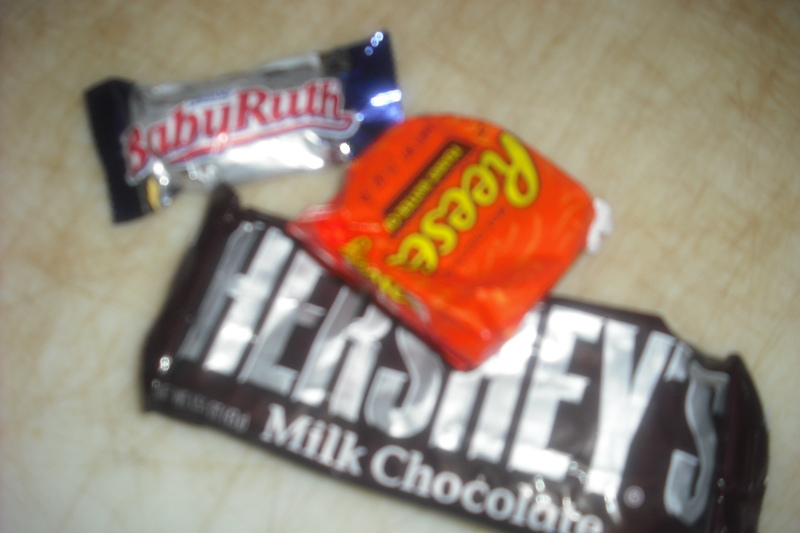 The rest of the candy was hidden at an undisclosed time after we went to bed. As hard as my brother and I tried to find the stash, my mom devised a hiding place system that was more complex than that of Sadaam Hussein’s during the invasion of Iraq. At my mom’s office, children visiting the dentist during month of October would be lectured in my mom’s dental chair about the evils of sticky sweets that cause plaque, cavities and tooth decay. But upstairs, in the staff lounge, far away from the X-ray machines and the drill and the spit sink, it was like Sodom and Gomorrah meets Candyland. All rules preached downstairs were broken, and there were bowls of candy everywhere! So, in a desperate attempt to hide the candy and protect my son’s mouth, soon to be fitted with braces, from all that sugar, I found a new hiding place: The warming drawer of my Kenmore oven. No one knows about the warming drawer. I barely even realize I have a warming drawer until I cook a big holiday meal. I guess should have told myself this after I had my first cup of coffee that morning. Last night, I roasted chicken for dinner, at 400 for one hour. It’s a good thing chocolate refreezes. HAHAHA…. “it was like Sodom and Gomorrah meets Candyland”. Hilarious! Maybe let him have free rein with the Christmas goodies this year…? You started my day with a laugh! Ah yes ,I remember those Hallloween’s well. And, your discription of our dental office was right on target..(I grew up with the expression,”Do as I say,not as I do”). How many times the staff would be found ,in between patients, digging into the “Stash”(but,of course we always brushed afterwards).